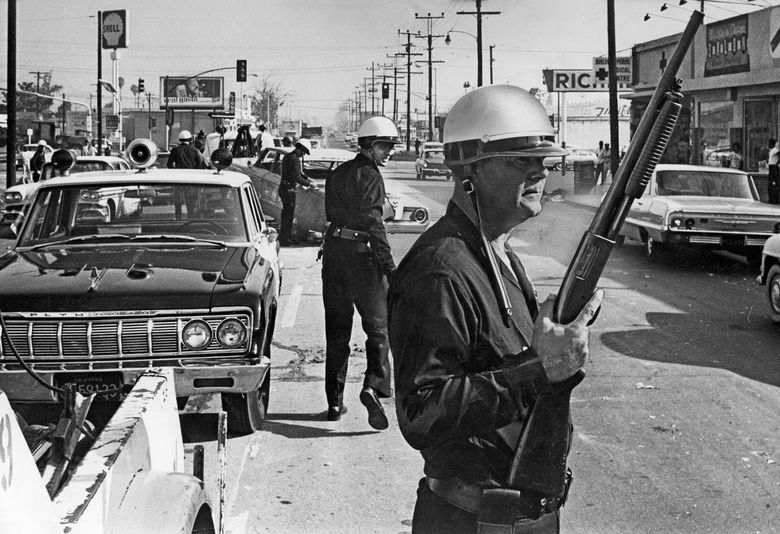 While poverty and tensions remain, the community has dramatically changed in the 50 years since the Watts riots broke out on the streets of Los Angeles for six days starting on Aug. 11, 1965. LOS ANGELES — Donny Joubert watched the boy round the corner of the public-housing project holding what looked like a handgun. The barrel was pointed at him and the two officers from the Los Angeles Police Department. The boy was 10 or 11 years old, Joubert figured, and had more gleam than anger in his eyes. Joubert, a community activist who grew up in the housing project, shouted and lunged for the gun. It was plastic. The police officers did not even reach for their holsters. “Somewhere else, that kid would be dead,” Joubert said. That interaction, Joubert said, is the best illustration of the way the community has dramatically changed in the 50 years since the Watts riots broke out on the streets here, for six days starting on Aug. 11, 1965. Confrontations between African Americans and the police are once again convulsing the country; inFerguson, Mo., where protesters gathered over the weekend to mark the one-year anniversary of the death of Michael Brown and the riots that ensued, a gunman fired at police on Sunday night and was shot, and other gunfire and skirmishes broke out. But Watts — once a symbol of urban strife and racial tensions — stands as a stark contrast. There were fewer than a dozen homicides in the neighborhood last year, compared with hundreds in 1965. Community leaders like Joubert, a former gang leader turned peacemaker and respected mentor, say relationships with the police have never been better. Still, this is no utopia. Each summer, Joubert, 54, helps run a summer jobs program for teenagers at Nickerson Gardens, the low-slung public-housing complex where he was raised. Twice last week, the teenagers were summoned inside because of shootings, administrators worrying that a stray bullet would graze them while they cleaned up the yards. And little of the trust Joubert has for the police has filtered to these teenagers. “They harass us all the time,” said Raydon Boyce, 19. “Don’t matter what you do,” Nigel Ewers added, echoing the sentiment expressed by all of the teenage boys taking a break one morning last week. This is not the same Watts their parents grew up in. While the area remains persistently poor, demographics have transformed it from an African-American enclave to a neighborhood that is more than 70 percent Latino. Many blacks have moved to the suburbs in the Inland Empire and the desert north of Los Angeles. Those changes have brought their own tensions — many black residents talk of feeling pushed out while Latinos have struggled to rise to political leadership. “Don’t really matter who you are, we’re just labeled as bad people,” Torres said. Big questions hang in the air here, sometimes asked aloud: Could what happened in Ferguson happen here? Could Watts explode as it did five decades ago? Alternatively, could the improvements that have evolved in Watts happen in Ferguson? There is a deep generational divide in the answers. Last summer, when LAPD officers shot and killed Ezell Ford, an unarmed mentally ill black man, less than a mile away, protest organizers wanted to march from downtown to Watts. Joubert and other leaders urged them to stay away, he said, fearing they would ignite long-simmering anger. After the police caught a group of youngsters who had been stealing from the offices of the Children’s Institute, Revoyr worked with officers to avoid pressing charges and instead sent them to a diversion program where they completed hours of community service. Every week for the better part of a decade, Joubert and more than a dozen other local leaders have met as part of the Watts Gang Task Force, exchanging information with the police and trying to find ways to quell tensions in the community, whether they stem from the latest gang fight or a police interaction. In some sense, the changes in the area are evidence of the uniqueness of the neighborhood, which covers just more than 2 square miles. It is, as some residents put it, the smallest neighborhood with the biggest reputation. The city’s Housing Authority has poured more than $10 million into special projects for its residents there in the last several years. The Police Department has dedicated 10 officers and a sergeant to each of the housing complexes, with officers generally signing on for a five-year commitment to patrol the area daily by foot. Police officers have begun a football league for 9- to 11-year-olds and routinely work as coaches on their days off. There are physical signs, too, that enormous challenges remain. The perimeters of the sports fields at one local middle school are fortified with mounds of dirt, meant to protect students from bullets. Residents celebrated a new park opened earlier this year on what had been a weed-infested lot for decades. Now, the gate to the park is locked, and the slides and skateboard ramps were empty on recent summer afternoons. The area remains physically isolated from much of the rest of the city, and crisscrossed by freeways and railroads. There is still no sit-down restaurant, but the father of the city’s food trucks, Roy Choi, has announced plans to open an eatery. The Children’s Institute will soon unveil plans for its new building, designed by Frank Gehry, which it hopes will function as a community center.